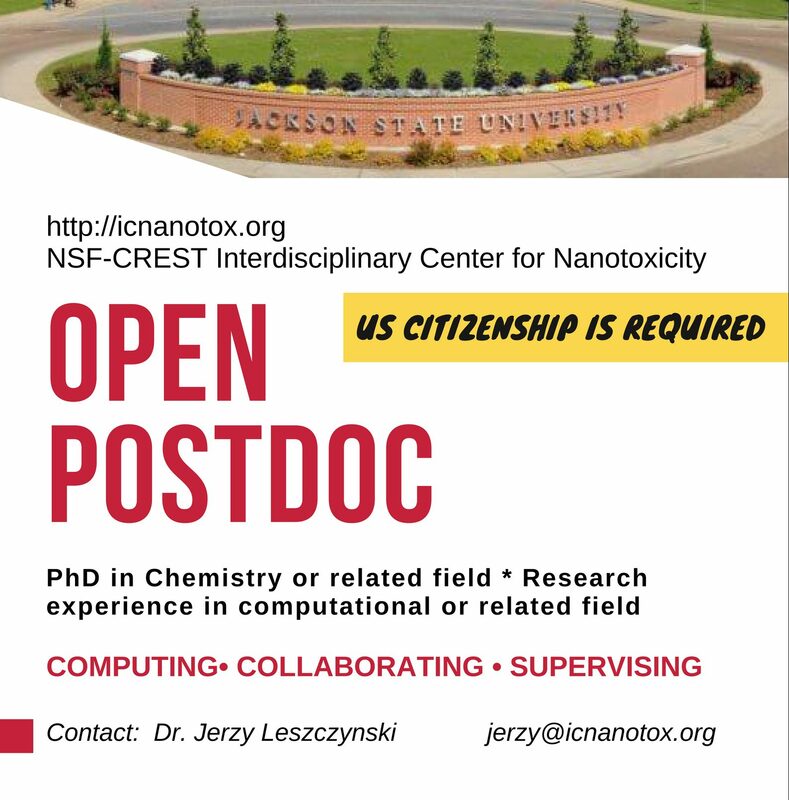 A postdoctoral position is available to work in the lab of Dr. Jerzy Leszczynski in the NSF-CREST Interdisciplinary Center for Nanotoxicity at the Jackson State University to provide the theoretical studies of various chemistry and biologic-related projects. We are looking for candidates with a strong background in the computational chemistry or related field, preferably with the experience in quantitative physical and chemical analysis and chemical applications of coupled clusters. The candidates should have written and oral communication skills and be highly motivated and adept at working within a team of theoretical scientist and enthusiastic investigators. The Interdisciplinary Center for Nanotoxicity offers an outstanding scientific environment in which to train and collaborate. The position offers the annual salary of $30,000. To apply, please email a current CV and recommendation letters to Dr. Jerzy Leszczynski titled “ICN Postdoc position”. The position will remain open until filled. Quantitative physical and chemical analysis and chemical applications of Coupled Clusters Theory.